I know, you have signed up for free stuff on those sites that promise to send you all these goodies, all they need is your email and your home address and maybe a short survey of what you like, and then none of the free stuff comes. But you get tons of “unsolicited” emails an mail to your home instead because they sold your information for their own benefit, and you got nothing. That’s because nothing in this world is free. I am sure you’ve heard this before. Well, luckily, there ARE legit sites where you can get FREE stuff, for a slight trade off. They require some feedback from you so that they can share the feedback with potential customers since most of these items are hot off the press, and not yet in stores. There is one catch.If you think you can just reap the benefits of the free stuff and not do any of the work, your mistaken. You’ll forfeit being able to get any free items in the future, and that’s not fun! Smiley360: Yes, the name is quite odd. I am still not sure what it means or how they came up with it but I have been a member of “Smiley” (that’s what we call it in the streets lol – j/k) for over 2 years now. You fill out some short surveys, and if you qualify for the mission, you get the item for free to try. They require you to successfully complete the mission by getting a certain amount of points. The points add up, I have over 2200 points right now, but I am still unsure of what they actually are used for. Keep in mind, you will need to share your feedback on your social media, usually Facebook, Twitter, and the Smiley360 online community. All of the items they give are full size items and I have never been disappointed. Check out some cute stuff we got here. BzzAgent: This site is a little more in depth when it comes to surveys. You’ll start with the initial 10-20 surveys of getting to know you, what you like and dislike, etc. You have to answer them accurately if you want to get stuff in the future you’ll actually like. You need to finish all of these initial surveys to get any campaigns. For BzzAgent, they want you to spread the Buzz. The typical follow up surveys include sharing on social media, in the BzzAgent community, and then the answers are moderated and either denied, in which you’ll need to rewrite it, or approved at various levels “Good, Great, Amazing” in which you’re awarded “MyPoints” which they’re affiliated with. This is an added perk because the Mypoints add up and you can redeem them on that site for gift cards which I have done. BzzAgent seems to have ups and downs with how many campaigns they have at any given time. I’ve qualified for as many as 3 at a time, to not getting anything but surveys for a few months. My issue is that I do forget to go follow up and complete any added surveys because unlike some of the other sites, they do not email you to let you know there are surveys waiting. All items are full size and usually it’ll be a coupon to go and get the item for free at a store. I have also won a $50 gift card from BzzAgent in the past! Check out some stuff I’ve gotten here. Influenster: The name speaks for itself. They give you free stuff based on your ability to be an “influencer”. When you sign up, they’ll ask you to add your social media accounts, blogs, or any other accounts like Google+ and it’ll calculate your total reach. Mine is currently at a little over 7K and it has fluctuated from time to time, to as high as over 12k and I am not really sure why. If you have enough reach, this site is definitely one of the best. They usually have things known as a “VoxBox”. It’s a fun little box that has a variety of items in it, some full size and some sample size but all great. The best part it, if you don’t look into it ahead of time, you’ll have a fun surprise box to open when it shows up to your door. The other great thing about Influenster is that it doesn’t stop there. For each voxbox you’re a part of, you’ll have an opportunity to complete tasks on the items you loved to get a gift set of even more items from the same company. I have scored quite a few of these prizes and it’s so great to be recognized from the brands. Most prize sets are valued over $40. My last voxbox was Makeup Forever HD in my exact shade – a concealer stick and foundation, both in full size. These 2 items alone are over a $100 value, and I have a chance to win additional items from Makeup Forever by completing more tasks. You can check out some of my influenster items here and here. Crowdtap: If you don’t mind getting tons of emails, then this is for you! As the name suggests, they’re tapping into the consumer database to get information on what works and what doesn’t. I personally get too many emails to keep track of, and I skip a bunch on a daily basis. I don’t mind getting them, but they get lost among the rest of the junk in my inbox. Crowtap used to focus on writing content and reviewing other member content to get gift cards, usually $5 each or up to $100. This was great and I won a few Amazon gift cards that way. Recently, they changed it up, and it’s more survey and mission based like the other sites. They do however still offer many ways to win gift cards if you’re up to taking a ton of surveys. I like to do it on my down time and it’s fun when they announce the monthly money winners, but again, I do forget a lot. The missions often supply full size products to try. Recently I’ve gotten Loreal shampoo/conditioner sets and Jiffy Cinnamon Peanut butter. These are things that will get used up in my house, and that is what I love about Crowdtap. It is usually consumables rather then useless stuff that’ll just linger around my house. I don’t get accepted into missions with them often since I forget about it, so I am happy when I do get chosen. Like the others, it is imperative that you complete the follow up steps necessary to “close” out whatever they need in return for sending you these items or you will get flagged and banned. PinchMe: PinchMe by far is the most simple site, with the least amount of effort needed up front, and after the fact, but it’s time sensitive. I used to have an alarm on my phone set to go off every Tuesday at 12 that said “Pinch Me” and if anyone else every saw it pop up, they’d probably be like “what the heck? !” When I got my new phone about 6 months ago, it didn’t transfer over and to be honest, I completely forgot about the site. I used to enjoy getting the little teal box in the mail, and the thrill of being one of the first inline on the site to get the best samples. The only issue is, they’re just that… samples. They aren’t full size like the rest although once in a blue moon you will score something worth while and potentially full size. They’ve also become a little to “adsy” for me and the constant ads in your face is a turn off for sure. I am not sure if they’ve stepped their game up at all, but I’ll be checking it out again myself. They great part is, these are all legitimate sites that I have personally been a part of for the past 2+ years. You can join 1, or join em’ all. Let me know if you have any feedback on any of these sites! The all new 2017 Mitsubishi Lancer was provided to me by DriveShop to test out and give my opinion. We took the Lancer for a nice hour and a half long ride to Fright Fest to test it out. Any excuse to go to a theme park is good with me! My initial thoughts were a bit skewed because I drive a fairly large 2016 truck, so any car is inferior in my opinion. This being a 2017, the first thing I noticed was it definitely couldn’t be the fully loaded version. It was not equipped with navigation which I thought came standard in almost every vehicle these days. But maybe I’m wrong. Either way, with this model, you’d need to get an upgraded package that includes navigation. This is my first time driving any Mitsubishi, so I am not sure if this is a standard for them, but the keyless entry in this specific car is a little odd in my opinion. I am so used to push start, that I guess I don’t understand why there would be an almost keyed like ignition start. It isn’t a key, but rather shaped like one, and you push it in and turn it. I just don’t see the point of it. Again, maybe it isn’t just this model, and its a Mitsubishi brand thing. My dream car when I was a teen was a Mitsubishi eclipse, and I never did actually get it, darn! There is a back up camera, like any other vehicle made after 2013, and it’s quite accurate. I felt comfortable relying on it as I packed in and out of parking spots and my driveway. Some vehicles cameras are not as clear, or do not include the entire view, but this one did. I loved the exterior. It was so pretty, especially when the sunlight hits it. This color is not just white, but it’s called Pearl for a reason. In the sunlight, it is such a beautiful, sparkling pearl color. The black leather interior really compliments it well, and the rims are stunning! Since I had this car for a week, I took it to and from work more then anywhere. I work up in the mountains, so the daily drive includes a vigorous incline on the way to work, and a long and slow decline on the way home. Let me tell you, this Lancer took it like a champ! I felt comfortable driving up and down the hilly slopes and felt like I had total control over the car. That definitely has to do with the face that it was 4 wheel drive option. There is a button in the center that you can switch easily between 2 wheel and 4 wheel drive which was a plus. The halogen lights were beautiful and helped with driving home from our long drive to six flags. They were super bright and I felt like it was a smooth ride home. Did I mention gas in this car is great!?! It’s everything I love about a sedan as opposed to my gas guzzling truck. What a nice vehicle inside an out. There sunroof was an added bonus, especially since it’s the fall and the beautiful sunshine is still poking through the clouds often. I didn’t get a photo of the trunk, but it’s a decent size for a 4 door sedan. I was able to fit food for the week for our family of 4 in the truck with no issues. It also has the option to fold down the back row seats one at a time for added trunk space. I have to say, the only con is the lack of navigation being standard. The driver and passenger seats were manual control, which is also a bit outdated in a 2017 model, but it’s less of an issue as it a critique. Overall, The 2017 Mitsubishi Lancer is a nice, reliable vehicle, and it starts at $24,000 which is very well priced for this car. It’s an affordable option for families that may not be able to make the jump to an SUV. You can ride in style while still having the room in the back to fit 2 kids in car seats and another passenger back there with them. Let me start off by saying that this is NOT a sponsored post. I have no affiliation with Six Flags and this is just my own experiences that I want to share with you. First off, before I even start, go get a season pass to six flags! Right now, it’s the best deal I’ve ever seen so I had to scoop them up for my family of 4. But you have to be quick because you MUST ACTIVATE the passes before Oct 31st, just 9 more days, to get the deal. It’s only $6 a month (auto-pay) per person for minimum of 12 months, for a COMBO GOLD pass that includes the rest of this year free including Fright Fest and Holiday in the park, Free Parking, and Hurricane Harbor for next year. That is only $72 per person for the whole YEAR and a one day ticket is $72 if you were to go just 1 day,so even if you only go one time the entire year (which is not very likely), then it already paid for itself! That’s why I think it is so worth it. They do shows throughout the year, bring a friend free of discounted, and so many other deals. During the end of the year, starting October, they’re only open Friday’s after 5:30pm and then on Sat and Sun all day. If you go during the weekends, you can spend the whole morning there and enjoy the fall and Halloween decor without and spooks or scares. Once the sun sets though, it’s a whole other story. So should you bring your young kids to fright fest? I say go for it. My boys had a great time despite the scary zombies roaming around. My 8 year old absolutely LOVED the zombies. I on the other hand tried my best not to make eye contact and used the kids as a shield LOL! I get creeped out with that stuff… It did make it easier having the kids with me because they didn’t bother us as much. My 4 year old didn’t mind the first time we went, I don’t think he noticed the zombies as much. The 2nd time, he was more aware of them and what was going on and he cried for a bit to go home. He kept looking over his shoulder and I felt so bad, but then I had a genius idea! I told him to switch jackets with his brother, and that it was so big on him, it was like a “blanket” and the zombies would think he was just a big blanket. It worked! He started to forget about it eventually and enjoyed himself the rest of the night. My favorite thing is seeing my boys enjoying themselves on the rides. They have a bunch of rides for young kids and a large area with stands and arcades. They really wound up having a great time despite the initial fear of the zombies. GET YOUR PASSES SOON! You must go BEFORE 10/31 to activate the pass to get the Combo Deal even if you buy the passes, it will not be combo unless it’s activated before then. 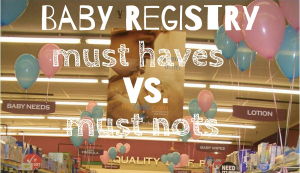 Baby Registry; Must Haves vs. Must Nots PLUS NOSE FRIDA GIVEAWAY! Baby Registries are so much fun.. You get a cute little scan gun and have as much time as you can afford to walk around and beam the little light onto anything you find adorable (that is the word you will undoubtedly blurt out a lot). The problem is, everything is adorable. By the time you are finished in the store, you’ll have a list much bigger then what you need, and most people will be purchasing for your baby shower based on that coveted list. So what do you NEED and what can you live without?Aside from the obvious large items like the Crib, Bouncer, Swing, and Pack & Play, I did a poll with over 100 moms from around the country and here is how they weighed in! Ok guys. This is such an easy recipe, even if you don’t have a baking bone in your body, you can definitely make this. In fact, this is a potluck type of dessert. You can bring it to any get together and it’ll be the biggest hit and no one will know you had to do the least work. Make this for your kids, your friends, or people you want to be your friends, because after they try this, they’ll keep coming back for more! 1 package of cool whip (thawed) or canned whip cream. 1 package JELLO Instant Vanilla Pudding. 6 fresh strawberries, cleaned and thinly sliced. In a dish, preferably tall and clear for esthetics, layer whole Nilla Wafers, Cool Whip, fresh strawberries, vanilla pudding, crushed nilla wafers, then repeat until it fills the entire dish leaving the last top layer for cool whip, fresh strawberries, and a dusting of crushed Nilla Wafers. Chill 2 hours – overnight until the wafers turn soft. It’ll taste like a fall apart strawberry shortcake. Serve in spoonfuls in smaller cups. Did you make this? Let me know your thoughts! Want to WIN a wristband? You can be one of TWO Lucky Winners! I HATE mosquitoes. Like, really really hate them. Yuck, it just grosses me out to no end thinking of them swapping my blood & my children’s blood with other people and animals, how disgusting and unsanitary!